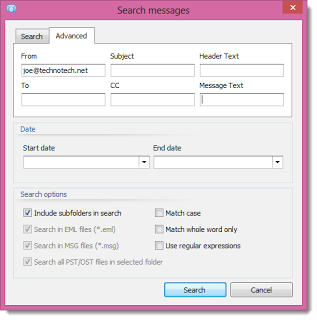 Outlook email messages come in range of formats, including .msg files and .pst files. Even those formats have variations. .MSG files are individual emails, and they come in the older Ansi and Unicode formats, and then in text, rich text and html formatting. PST contain many email messages. A .pst file created by older Outlook versions (pre-2003) also may also exist in ANSI format, while later files are in Unicode format. With email stored in so many different formats today, archiving and accessing these files can present some challenges. That’s where an email viewer like Pst Viewer Pro is a handy addition to your Windows software toolbox. 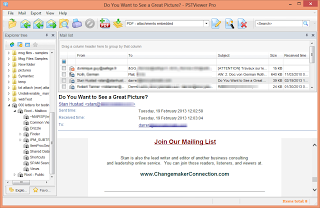 Pst Viewer Pro is a single software app that can open all forms of .pst, .ost and .msg files. It can also open .eml files which are produced by email clients such as Thunderbird, Windows Mail or Outlook Express, as well as .mht/.mhtml, and winmail.dat files. Pst Viewer Pro works runs on Microsoft Windows 7, 8, 10 as well as 2008 and 2012 server. It previously ran on Windows 2000 and ME, but is no longer officially supported on those operating systems. 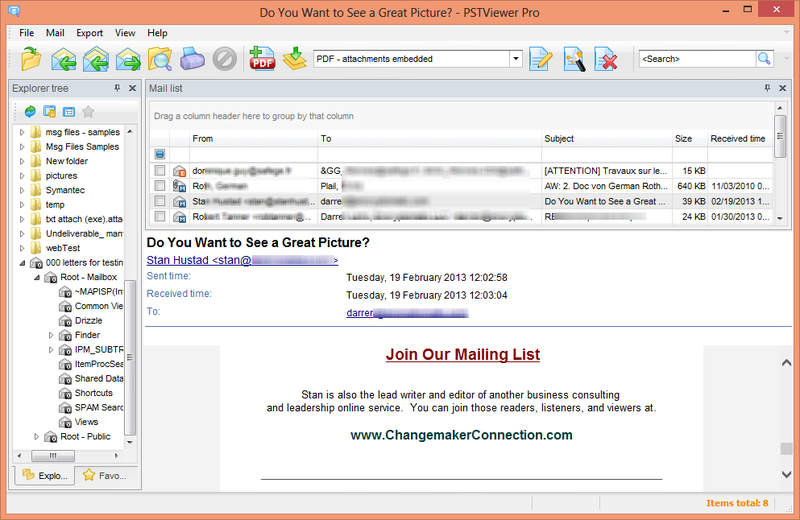 Download and install the Pst Viewer Pro trial and use it free for 15 days. After that time you will have the opportunity purchase a perpetual license that will not expire. Depending on your Windows operating system, Pst Viewer Pro installer will automatically install either a native 32 or 64 bit application. The 64 bit app can take advantage of your computer’s higher memory allocations. To see which version was installed on your computer, go to Help>About. You’ll see the version number. If the 64-bit version has been installed, it will appear next to the software version number, as in this image. Using the folder navigation on the left side of the screen, select the folder that contains your Outlook email message files. Pst or Ost files in the folder will appear in the folder list, allowing you drill into the file to select the folder that you wish. Email within the .pst or .ost file folder will populate the mail list. Right click on the top folder and choose “Switch to Scan with Subfolders” if you want to load all of the emails within the pst/ost file into the mail list. 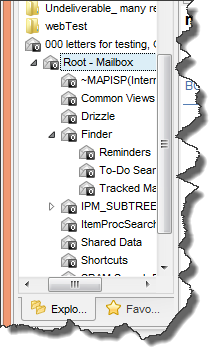 Individual emails are displayed in Pst Viewer Pro’s mail list window. You can sort the list quickly by clicking on the column headers. A viewing pane below the mail list lets you preview the selected message. To open the message in a full and separate viewing window, just double click on the message in the list. With PST Viewer Pro, you can easily access file attachments in the email. Double click on them to open them in their native application, or save them directly to your desktop, either by dragging and dropping the file outside of Pst Viewer Pro, or by using a right-click operation and selecting the destination folder for the files. Pst Viewer Pro supports detailed search operations to help you locate the messages you need. On the main tool bar, you can do a quick search just by typing in a keyword you would like to find. Quick search goes across all fields and displays messages with that keyword. More detailed search operations are supported by entering the search window. Click the Search icon in the main toolbar to bring up the search window. The results of the search operation will be shown in the mail list. Some times it is convenient to save a message as a pdf or image file. 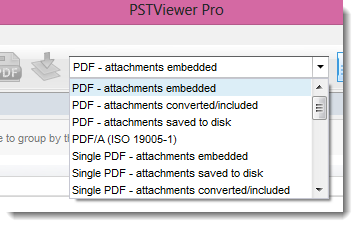 Pst Viewer Pro provides strong capabilities in this area. Converting email is a simple matter of selecting the messages you want to export and then indicating the desired format from the main toolbar. To select all emails in the mail list, type ctrol-A. You can also choose emails individually, or using the shift key you can choose a range of emails. The Pst Viewer Pro main menu allows you to select the export profile you require. Several different methods of export-to-pdf operations are supported. Select the PDF export profile. How you choose to manage email file attachments are important. While any virtual PDF printer can allow you to print an image of the email to pdf, few applications if any have Pst Viewer Pro’s ability to let you manage file attachments in such a variety of important ways. You can export email to pdf with file attachments embedded as individual file within the pdf. You can extract the file attachments to a location on your computer, removing them from the pdf altogether. Or, you can attempt to convert the attachments into the pdf image; in this case the email will first be imaged, and the attachments will follow. If the attachment cannot be imaged (for example if it is a binary file) then it will embedded within the pdf as a separate file. Pst Viewer Pro also supports the PDF/A (ISO 19005-1) standard for long term archiving of email messages. In this mode, fonts are embedded within the pdf so that the message can later be rendered accurately. 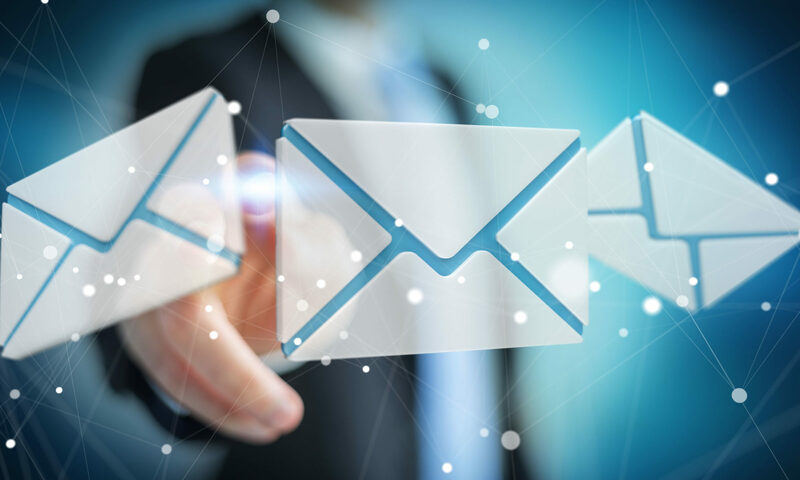 Also supported is the export of multiple emails into a single PDF file, and the appending of selected or individual email messages to an existing PDF file. Pst Viewer Pro makes it easy to change the file types it is associated with. 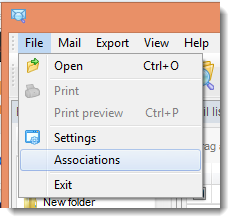 Just go to the File menu, and choose Associations. 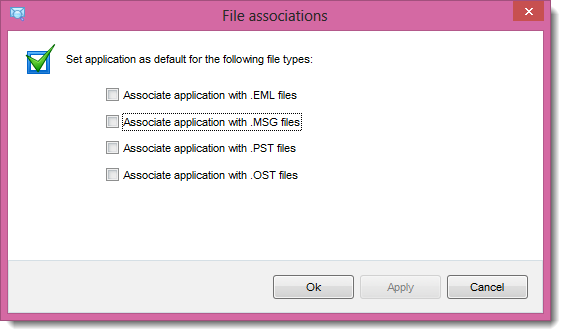 Select the email file types you want PST Viewer Pro to manage, and it will change the settings in Windows. 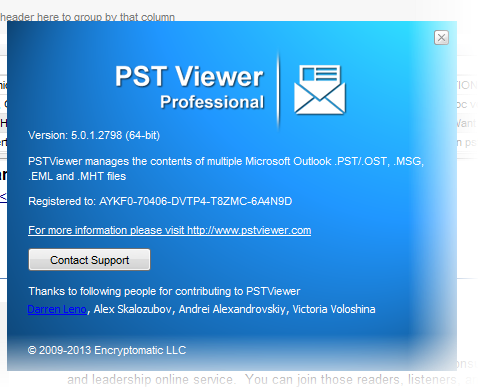 We thank you for reading this article about Pst Viewer Pro. If you think it could help you manage your email content, you’re welcome to give it a try! Download a free 15 day trial. If you have any questions, contact the Pst Viewer Pro support team and they’ll be glad to help. A single license of PST Viewer Pro is $69.99 with discounts starting at 10 licenses. To learn more, or to receive a quote, call 1-651-815-4902 x1, or email sales at encryptomatic dot.